Charles Kay Ogden (1889–1957) and Ivor Armstrong Richards (1893 – 1979) was an English linguistic and English literary critic. Both of them were recognized by their book called “The Meaning of Meaning: A Study of the Influence of Language upon Thought and of the Science of Symbolism”. Ogden worked as philosopher, writer and linguist. He was a founder and editor of weekly “Cambridge Magazine” in 1912 and later it ceased in 1922. Richards was working as a Professor in Magdalene College at Cambridge. This theory emphasis that the meanings are not residing with words it resides with the people. Charles Kay Ogden and Ivor Armstrong Richards identified that understanding comes from within the people rather than from the words they just interpret. 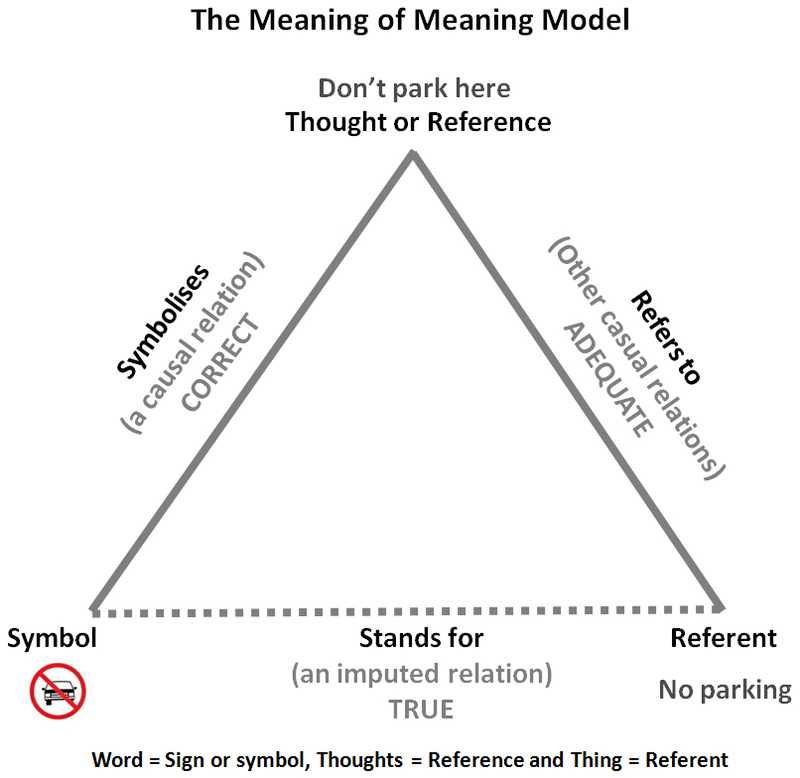 They set a model called “The Triangle of Meaning” for better understanding how language works and basically it is a theory of signs. The triangle is meant to show the word’s relationship between thoughts and things. The Semantic Triangle shows the direct relationship between Words & Thoughts and Thoughts & Thing. But the dotted lines represent the word (sign) is not the Thing (a referent) and there is no any direct relation between words and thing. The referent needs some prior experience and reference about the word or sign to be comprehensive. The word means different things to different people in different situations. Any sign or word which has its own meaning is grasped with certain references to it. The process of grasping or understanding words or signs, which already have meaning, with the asserted meanings given by the references is called the meaning of meaning. The word “Book” – A people (referent) have some kind of reference (thoughts) in their mind about the shape, size etc. so they can able to visualize it. But the same word “book” is written in some other language will not understandable and they can’t visualize it. The referent needs some kind of previous experience or reference to understand the words otherwise they cannot understand. Ogden and Richard were improved the Saussure’s dyadic semiotics. The analysis of major psychoanalyzing theories can be seen in this model. This theory is more about misunderstanding and its remedies. Charles Kay Ogden and Ivor Armstrong Richards studied about the misunderstanding that happens due to the difference in understanding worked forward for the remedies. This theory is the product of their working towards the remedy rather than a remedy. The meaning of referent is not clear; is the referent the audience / receiver of the object referred to ? Triangle of meaning works only for experience words, concrete, and denotative meaning. What about words dealing with qualitative characteristics. Your comment, please, thank you.